Prominent & Leading Wholesale Trader from Mumbai, we offer drop forged drag chain link and wet scraper chain link. 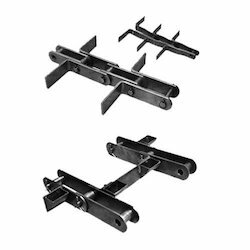 Matching with the changing needs of customers, we are engaged in offering a large array of Drop Forged Drag Chain Link. We provide Drop Forged Forked Chain Links (102 – 216 mm pitch) for transportation of abrasive material in hot working condition. The product we offer to the patrons find application in Heavy-Duty Drag Chain Conveyors, Wet Scrapers, Boiler Feeders and Mill Hoppers, Ash Handling Conveyors and many more. Moreover, we offer product to the patrons at affordable rates and as per their needs. To meet the growing needs of customers, we are engaged in offering a wide range of Wet Scraper Chain Link. Wet Scraper offered by us is employed for the transport of granular slag, ash from mineral coal or lignite, smelter ash or incinerator ash. Molten ash leaving the combustion zone drops is transported by scraper conveyor from the water bath where it is cooled. Besides these, our product is quality approved and available as per the industry standards.